Newcastle defender Chancel Mbemba is teased by his international team-mates over the uncertainty over his age and birthday. Mbemba, whose move from Anderlecht for a fee of about £8m has been completed, is under a Fifa investigation for two registered birthdays in 1988 and 1991. "I don't think a day passes without mentioning his birthdays," said his DR Congo team-mate Gabriel Zakuani. 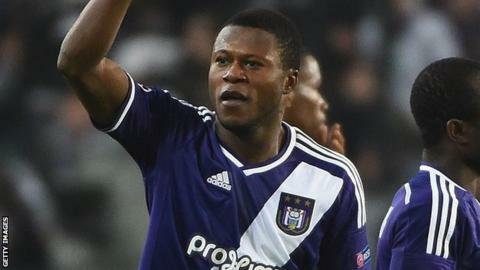 Mbemba, 20, won the 2014 Belgian title and has Champions League experience. He becomes Newcastle's third major transfer of the summer after they signed PSV Eindhoven midfielder Georginio Wijnaldum for £14.5m and Anderlecht striker Aleksandar Mitrovic for £13m. The full-back was registered as being born in 1988 by his first two clubs in the Democratic Republic of Congo but given a 1991 birthday on a document submitted for an Africa Cup of Nations qualifier by his country. Anderlecht, who he joined in 2012, listed his birthday as 8 August 1994 while it has been reported that Mbemba himself thinks he was born in 1990. "He takes it all in good heart," Peterborough United's Zakuani told BBC World Service. "It's something that follows him but he's a very good player. I'm on his side. And to be honest he's quite a big lad so I'll agree that he's 20." Mbemba has been granted a visa by the Football Association but must now obtain another visa overseas - a process which is expected to be a formality. The versatile defender played 36 times for Anderlecht last season - including all of their Champions League group matches - and formed part of the side which one the Belgian Pro League play-offs in 2013 and 2014. "I agree with the comparison many people make to Vincent Kompany," added Zakuani. "He plays that same aggressive game, doesn't give his opponent any space to manoeuvre and he's very quick and reads the game well. He's got all the attributes that Kompany has and because he's so young he can go as far as he can." Newcastle manager Steve McClaren said: "He is a proven performer at the highest level, he's powerful, combative and will add quality to our defence. He also has an eye for goal which is an extra asset for us." Mbemba, Wijnaldum and Mitrovic could make their Premier League debuts against Southampton on 9 August.